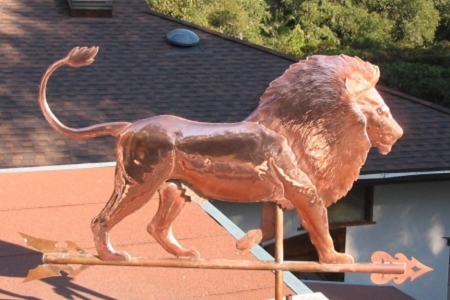 The Lion Weather Vane, Panthera leo, shown here was fabricated in copper with optional gold leafing on its mane and tail tip. 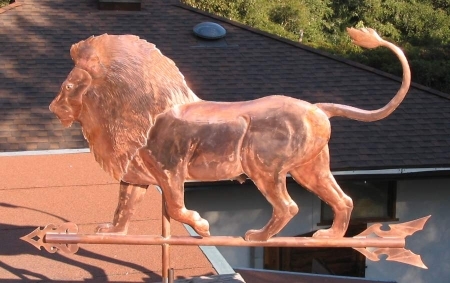 The copper lion will first patina a rich chocolate brown color before eventually turning a beautiful turquoise green. The golden mane and tail will retain their warm yellow color throughout this transition. 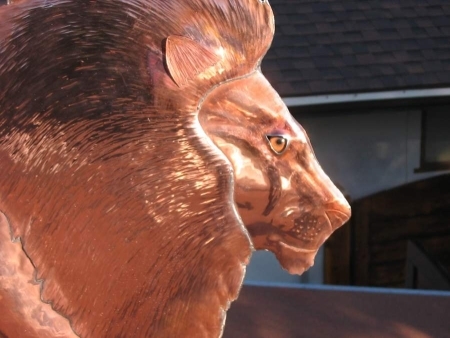 We used custom taxidermist glass eyes to give this lion his intense lifelike appearance. 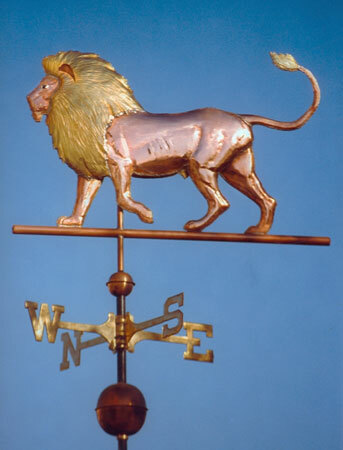 This weathervane has been popular with families whose names are in some way associated with lions; for example, Leo, Leone, Lyons to name but a few. Also, people born under the astrological sign ‘Leo’ (July 23-August 22) tend to like this weathervane design as well. Not surprisingly with these associations, this weathervane in particular has been an attractive gift for birthdays and holidays. For those who like lions, we also offer a Lion Rampant, a Lion of St. Mark and a Griffin Weathervane (half eagle, half lion). In addition to name and astrological associations, many business and sports teams adopt lions for their mascots or logos, representing strength, prowess and courage. In book and film the lion is championed. There is Aslan the Lion from C.S. Lewis’s ‘The Lion the Witch and the Wardrobe’, and Aesops Fables as in ‘Androcles and the Lion’, as well as Rudyard Kipling’s ‘The Jungle Book’. The lion, Panthera leo, is one of the four big cats in the genus, Panthera, and a member of the family, Felidae. It is the second-largest living cat after the tiger. Wild lions currently exist in sub-Saharan Africa and in Asia where an endangered remnant population still maintains. Lions live for 10–14 years in the wild, while in captivity they can live longer than 20 years. In the wild, males seldom live longer than 10 years, as injuries sustained from continual fighting with rival males greatly reduce their longevity. Lions typically inhabit savanna and grassland. They are unusually social compared to other cats, forming ‘prides’, which consist of related females and offspring and a small number of adult males.